← Timing for a change? or A Path to Democracy for the People, by the People. Today was very exciting. After digging out the compass and protractor, measuring, comparing, learning about costs of bending pipe, stress points, bend radii, gauges and tensile strengths, I’ve thrown together a conceptual custom built motor mount. Now, I’m well aware my mediocre handyman skills leave a lot to be desired as denoted by the ‘straightness’ of my drilling 7/8″ holes in a bit of 2×2″ wood by eye and it is certainly not the finished product! I’m playing about with two different aluminium frames to test out differing assembly styles and I’m posting a quick taster early to give some more ideas for a recent commenter, Lutheran who is at an early build stage currently. Well, it fits, holds the motor and battery and even when I forgot myself and took the battery out before removing the motor, the frame stayed put!! In the first photo you can see where the Ram mounts fit. They are there as I’d noted they would sit in similar locations to the rod holders I’ve seen on rigid hull kayaks and this is something that is difficult to achieve on inflatables. The crossbar where the Ram mount is fitted is not certainly going to stay there, it is just there for now to keep the frame together although it does add rigidity. I’m toying with the idea of a fabric strip across the middle to provide a firm backrest that the included Sevylor seats really fail to provide. The second photo shows it all in-situ, filling up my hallway and clearly showing how skewed my drilling is! Had wondered if the rear pipe ends could be used to fit the outriggers I’ve seen that can be fixed to Ram mounts although they may be too far back on the vessel. Having the Ram mounts there in any case would lock the rear wooden bar so they may become integral. It was originally intended to sit the battery horizontally (as you can see in the first photo by the small wooden tray) but as the frame manages to sit snugly slightly further back than expected, the battery slots in better as you can see below. The other frame I have to test has a larger battery loop which provides a longer flat base that could be better suited for lower sided vessels or for fitting on rigid hulls. There are a lot of variables in terms of possible additional fixtures that could be added to fit differing vessels. I’m still toying with the benefits/drawbacks of trying to make the width of either the front or back of the frame variable in order to fit differing hull shapes but that will have to wait until I get down a local kayak shop to check how it might work. I must say, although early days, I’m quite chuffed with this design so far and am keen to see how it balances as a carrying frame (including if it will bend at all) once it is fixed solid. 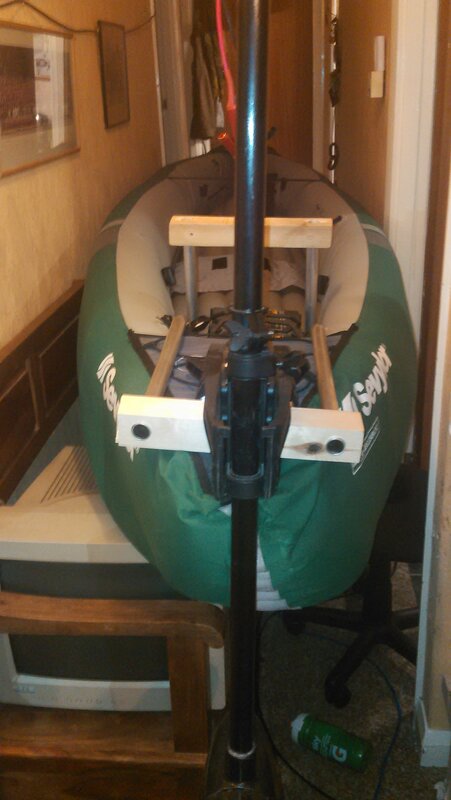 This entry was posted in Inflatable Kayak / Canoe - Motor Mount and tagged adventure plus, bison electric motor, canoe, electric outboard, inflatable, inflatable kayak motor mount, kayak, motor mount, Ram mount, sevylor. Bookmark the permalink. Realise I am a little late to the party on this one, but I want to do exactly the same thing with my sevylor adventure plus and it seems that you are the only person in the world who has tried and written about it. Did you have any success with this final idea? 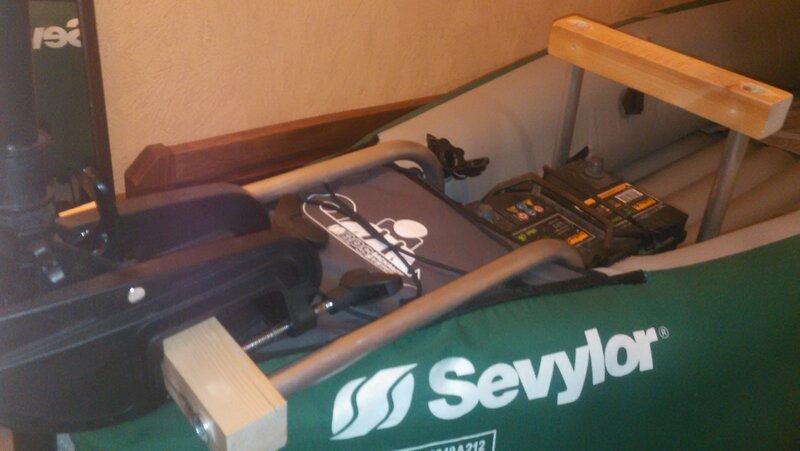 I would love to do the same, I will try to box up the battery with the box doubling up as my sea (the seats that come with the sevylor get tiring after a couple of hours). Doesn’t matter when you join so long as you enjoy the Sevylor with or without power!! An injury plus looking after my mother for the past couple of years put all personal projects on hold sadly. Got to finish it soon though as I can’t currently carry the rig due to my injury, so the wheels would be great! In June I’ll be visiting the people who bent the tubing for my two prototypes to see if they can fit the remaining parts to get testing again. Probably need a new battery after all this time, last time I got out was for a birthday treat in August 2016 and spent the whole day pottering around Poole Harbour…perfection. “Thanks for your response and sorry for my incredibly related one. A house move and wedding have made for a hectic couple of months. I hope your visit re: the prototype went well and would be interested to hear how you got on. It’s an ingenious idea! I took inspiration from your metal work but had to go a different route in the end, mostly because it tied in with my outrigger and seat plans. i mostly go on sea with a mate so stability is key! 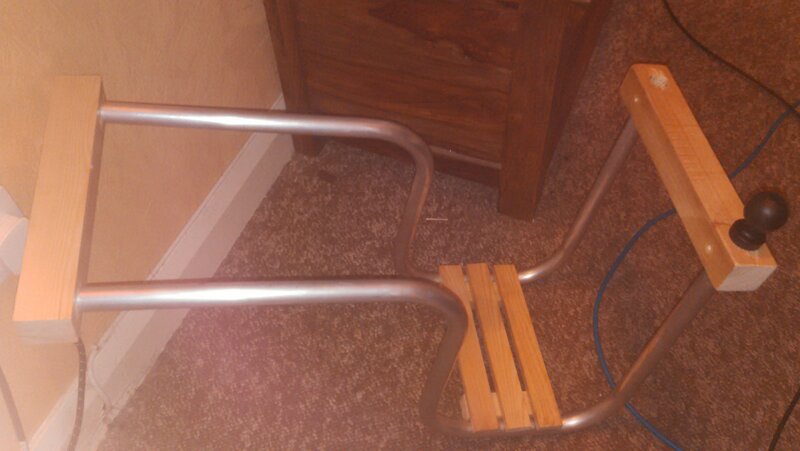 bought two eBay folding bar stools 15qyid from Gumtree. Used the wood in the seats for support behing the inflatable padding, and the metal for motor mount (it’s the perfect shape) and outrigger poles (needed some bending but nit much). Glad to hear your progress and ingenuity at work in creating your own design. Reading through your build sums up why I think a generic design hasn’t popped up on the market. If one spends enough time around the water and boatyards it is soon apparent that the spirit of tinkering and improvising is very much alive and well. So, rather than look in a shop or online, the average mariner would rig something up to suit their needs! Probably why I like the milk crate design so much, simple and effective. Since it will take longer than I’d hoped to rehabilitate from an injury, I’ve invested in one of the folding garden trolleys that purport a loading weight of 70Kgs to cart my gear for the meantime. I’ll replace the Maplins link with a link to the one I bought..
Hope you’re all set now and had a chance to test it out in the fine weather!